Freechoice: Enjoy a walking tour of the city or board a local ferry and sail the Danube Gorge to view Weltenburg Abbey, sampling beer from one of the oldest monastic breweries in the world. 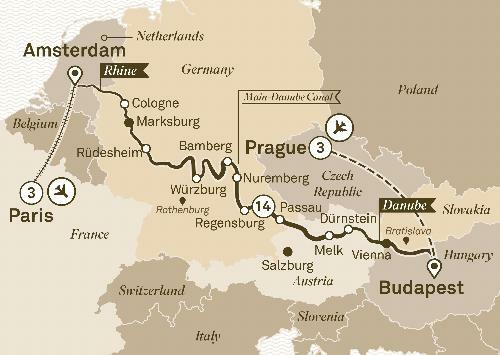 You could also cycle to the Walhalla monument, or take an active walking tour to Thurn und Taxis Palace. Freechoice: Explore the city on foot or visit moving WWII sites, or take a baking class. Freechoice Dining: Tonight savour delicious cuisine at the restaurant 58 Tour Eiffel before a short sightseeing cruise on the Seine River. Alternatively, take in dinner and a show at the world-famous Lido. Starting in Prague and Budapest, and ending with a flourish in Amsterdam and Paris, take in the splendours of Europe, from one end to the other. Hidden behind the iron curtain for so many years, the glory of Prague and Budapest is now on full display. As you wind your way in 5-star luxury, enjoy your stops at majestic Vienna, Nuremberg and Cologne, to name just a few.